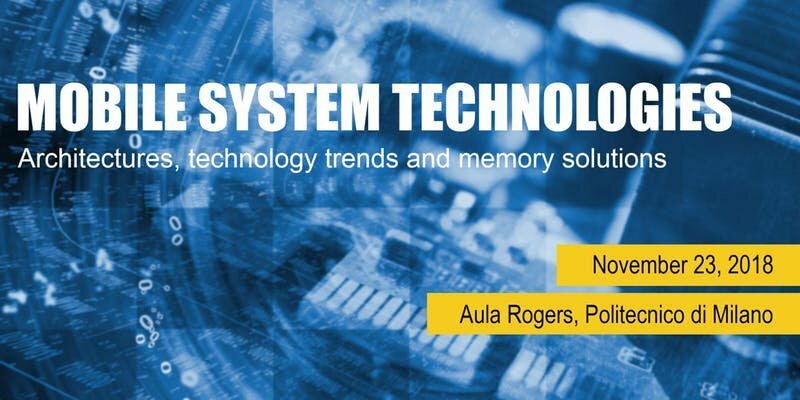 On November 23rd, 2018 the 4th Workshop on Mobile System Technologies will be held at 9.00 am at Politecnico di Milano in Rogers Room. MST workshops bring together researchers, professionals, and industrial engineers with an interest in technologies for mobile systems. The third edition offers a comprehensive view on architecture models, technology trends, and memory solutions enabling personal and industrial mobile systems, including smartphones, tablets, smartwatches, IoT devices. The interest is on the role that memory and storage subsystems play upon system performance, energy, dependability, security, and functionalities. Confirmed speakers include experts from leading companies and universities, among which Micron, Politecnico di Milano, ETH Zurich, Security Pattern, Politecnico di Torino, Imagination Technologies, and STMicroelectronics. MST 2018 is organized by Fondazione Politecnico di Milano and sponsored by Micron Foundation, Politecnico di Milano and AEIT/AMES.